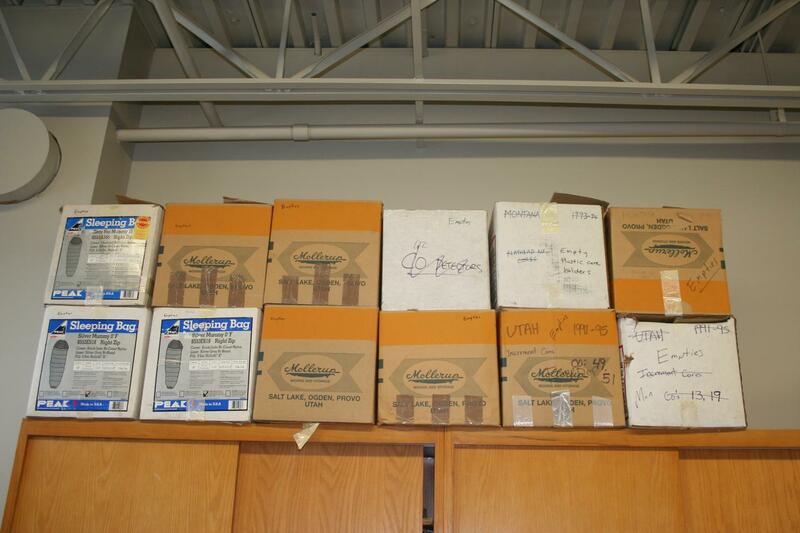 A treasure trove of data about tree growth in the US West was found in these boxes, each of which contained 500 to 800 cores from individual forest trees. The cores are from the U.S. Forest Service Forest Inventory and Analysis program. Once measured and analyzed, the annual growth rings in these cores revealed that the growth rate of trees in Southwest forest may decline as much as 75 percent by 2100. Southwest forests may decline in productivity on average as much as 75 percent over the 21st century as climate warms, according to a new research. The new estimate is better than previous ones because it is based on a new database of information on the growth of trees under average conditions, according to the research team. Previous estimates were based on a database that included many trees growing in marginal conditions. When the trees in the ITRDB were initially sampled, which was often decades ago, researchers chose trees living in marginal conditions because those trees were most sensitive to climate variation and thus best suited to reveal how climate varied over the past centuries. Tree-ring researchers have long known the ITRDB samples might overestimate the effect of climate on average trees, but had no other data to use until now. And, even though the trees in the ITRDB may provide an overestimate of how the average forest tree will respond to the change in climate in the 21st century, that information is still valuable, Evans said. “Those trees are the canaries in the coal mine — the edge of the forest is where we’re going to see the change first,” she said. The research paper by Klesse, Evans and their co-authors, “Sampling bias overestimates climate change impacts on forest growth in the southwestern United States” was published in Nature Communications on Dec. 17. A list of co-authors is at the bottom of this release. The U.S. Department of Agriculture, the U.S. Environmental Protection Agency and the Navajo Nation funded the research. The new collection of Forest Inventory and Analysis tree cores turned up when scientists at the U.S. Forest Service Rocky Mountain Research Station in Ogden, Utah, were moving from one building to another. The researchers were surprised to find a bunch of dusty boxes filled with tree cores that had never been analyzed. The cores had been systematically collected from trees throughout the eight interior states of the U.S. West during the 1980s and 1990s. The cores reflected the growth of individual trees going back to the 1920s and some even earlier. Co-authors R. Justin DeRose and John Shaw of the U.S. Forest Service Rocky Mountain Research Station began the painstaking job of measuring annual growth rings from the approximately 20,000 cores, each from a specific tree. The two scientists enlisted Evans and sent her about 2,000 cores from Arizona trees. Her research team, which included eight UA undergraduates, began cataloging those cores and recording the data from them in 2015. The researchers wondered what the new tree-ring records might reveal about how climate change would affect the growth of forest trees of the Southwest in the latter half of the 21st century. To figure that out, they focused on records from common pinyon pine, Douglas fir and ponderosa pine from Utah, Colorado, Arizona and New Mexico. Klesse, who is now a postdoctoral researcher at the Swiss Federal Research Institute WSL in Zurich, compared information from the newly analyzed cores from “Joe Schmoe” trees, plus additional tree-ring growth records from 858 trees in Arizona and New Mexico, with the records in the ITRDB. For projections of the region’s precipitation and temperature in the 21st century, he used climate projections from one of the most current climate models, CMIP5 (Coupled Model Intercomparison Project Phase 5). His analysis revealed that growth of the ordinary forest trees would not be reduced as much under climate change as the trees whose records are included in the ITRDB. Even so, he said, “As the climate warms, tree growth will decline.” Evans said, “The trees have to take whatever they get in terms of climate conditions. When the temperatures rise they have to cope with it — or not.” She and Klesse are expanding their research to include data from 30,000 cores collected from Douglas fir trees spanning the continent from Mexico to Canada.